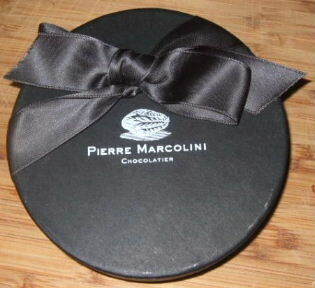 Truffe Du Jour: The Truffe Du Jour is Pierre Marcolini’s tribute to the traditional truffle with a dark chocolate ganache made from cocoa beans from Venezuela and rolled in cocoa powder. This piece has an incredibly soft ganache center with a slightly harder shell, but one that is still very pliable. The chocolate quality is very refined, embracing the concept of bitter more than sweet. The taste of this chocolate is an essence, almost like an idea or a hint; rather than scream â€œI am a Hersheyâ€™s Bar!â€ it dares you to take a bite and figure it out. This chocolate is for food purists. Truffe Champagne: The Truffe Champagne has a milk chocolate center made with cream and champagne sourced from Saint Martin D’Ablois in the Champagne, France. This piece is softer on the tongue and a bit sweeter because of the milk chocolate involved, a brilliant choice as dark chocolate would drown out the subtle flavors. The champagne is a note amid a chorus of flavors – important, but hardly the centerpiece. Despite containing alcohol, it doesnâ€™t really taste of it. This one was surprisingly easy to enjoy without treading in overpowering waters. My favorite. Truffe Tonka: The Truffe Tonka has a liquid caramel center infused with the South American spice from the Tonka bean. Enrobed in dark chocolate couverture and covered with deliciously crunchy cocoa nibs, this truffle’s center has a sweet and spicy vanilla-like aroma and herbal fragrance. I was a bit surprised to see tonka bean as an ingredient, considering itâ€™s banned in the U.S. for possessing an anticoagulant property that can cause death if consumed in large amounts. 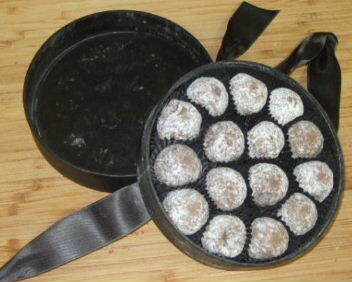 Despite it being the fugu of chocolate, it retains a cinnamon essence that meshes well with vanilla. The flavors involved are very subtle but sophisticated, partly because tonka bean is such a complex flavor that it certainly makes any piece of chocolate quite intriguing. After eating a box of these, I can say that I do think these are fairly priced… but I happen to like this sort of chocolate. None of the pieces are sweet or bursting with potent flavors. That is because Pierre Marcolini enjoys making you think when you consume his products. What exactly is in this piece? What does this remind me of? How is this different and more surprising than anything I have ever tasted? These answers are all deeply personal and individual, but a pleasant surprise from something as mundane as a gorgeously packaged box of truffles.